Very similar to the more traditional “Leland” model from Delta is the 9113T-AR-DST called “Essa”. With a more modern look and nearly all the same features, you won’t make a mistake choosing this one too. The Essa model from Delta is very similar to the Leland model and is following the same style Delta models have. 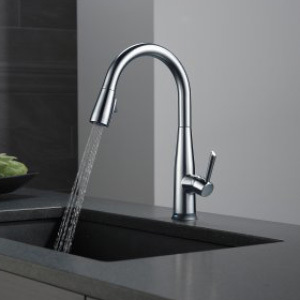 The 9113T-AR-DST model uses the same Touch2O technology that many Delta kitchen faucets have. You only need to touch the spout anywhere and the water will start flowing. The same thing needs to be done if you want the water to stop, a small touch anywhere on the spout will be just enough. If you need to wash the sink there’s the 20-inch hose coming out of the spout. It is not very long but it will be very helpful for some situations. Getting back on its place is helped by the special magnets placed on both sides. When you get the spray head close to the spout it will connect using the magnetic force. This way you can be sure the faucet will last longer. The Essa model has two different streams – spray or stream. It misses the great ShieldSpray option from the Leland model we previously mentioned, so this is something that is really missing here. The temperature led indicator, however, is on both models, but on this one looks much better since the design is more futuristic. When the water is hot, the light is red, and when it’s cold is blue. The Touch-clean technology allows the user to clean the nozzle with just a rub over it. It is specially made of rubber that can be easily cleaned and the mineral build-up will never stay for a long time. The Delta company offers a limited lifetime warranty on this product which really speaks for its quality. It uses 6 AA batteries or, if you don’t like the idea of changing batteries all the time, you can plug it in a power socket. The faucet can be connected to an AC socket and you can forget about the batteries. The design is modern and the whole faucet looks very futuristic. Even though the features are similar to the Leland model, the look is completely different. 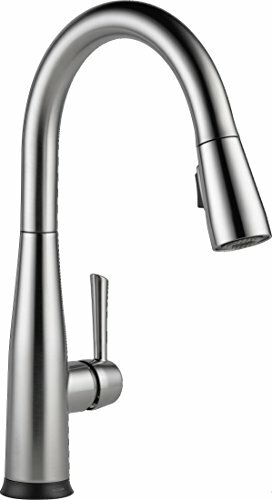 The Essa faucet is made for people that prefer the modern look and have a kitchen in a modern style. The high arc reaches 15.2 inches and the spout reach is 9.4 inches. 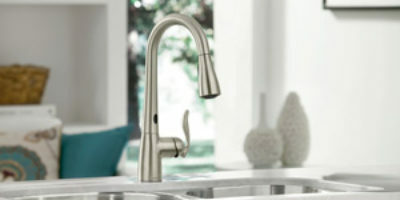 The beautiful and clean line of the spout continues with the spray head that looks exactly like the rest of the faucet. With it, you can control the commands that regulate the stream and use the hose that is nicely made to dock back after usage. The docking is easy because of the magnet system this faucet is using. After docking the spout looks like it’s made of one piece which is something that really gives a class to this model. Essa is also made from bronze but the finishing is optional. Just like the Leland model, there’s a matt black version, a Chrome finishing, Arctic stainless option, and a Venetian bronze finishing. They are all beautiful and it’s up to the user to choose which one they like the most and fits the best with the rest of their kitchen. 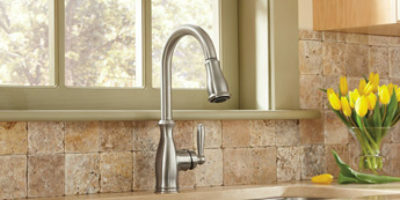 We’ve also picked out and reviewed our favorite high-rated kitchen faucets to help you buy.